LINCOLN, Neb. -- You’ve seen them play now, so let’s ask one more time the question everyone’s been asking all spring: Does Nebraska have its quarterback? The Huskers might have three quarterbacks. Tanner Lee, Patrick O’Brien and Tristan Gebbia, the three on scholarship, combined to go 52-for-81 (65.2 percent) passing for 592 yards, five touchdowns and one interception. Lump them all together and you have a pretty decent day in the Big 12. Individually they put up numbers that are more than fine in the Big Ten. Wisconsin won the West in 2016 while throwing for 179.1 yards per game with a 62.5-percent completion rate and a passer rating of 135.85. Iowa won the division in 2015 at 204.4 yards per game, 61.5 percent and 139.16. Lee’s day was classically Big Ten – 13-for-19, 190 yards, three touchdowns. If you’ve got a serviceable run game and a defense, that right there will win a lot of games in this conference. O’Brien’s line – 11-for-17, 134, one touchdown – would’ve asked a little more of that run game and defense, but the redshirt freshman showed he was capable of piloting this offense, too. If he was the Huskers’ only option going into the fall, I don’t think there would be much cause for concern. Mike Riley said Gebbia will take the O’Brien path in 2017. Nebraska will prepare him as though he’s the third-string quarterback and hope it never has to use him, thus preserving a year of eligibility. 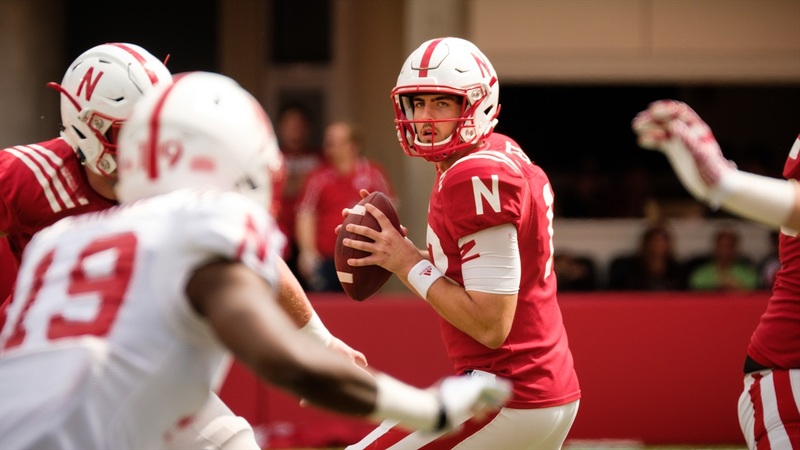 But Gebbia showed enough on Saturday that if the Huskers absolutely had to take their swings with him at quarterback they would probably be better off than most teams forced to use a true freshman would be. He ran the backup offense most of the day, hitting on 19-of-30 passes for 213 yards and the game’s only interception for the White team. In one drive with the Red team, Gebbia went 9-for-15 for 55 yards and a touchdown. Insert your standard spring-game disclaimers here: it’s a practice, there were vanilla defensive looks (particularly true today), the first team should be better than the second team, etc. Those are all things that matter, but even after weighting what we saw for those various concerns, I still came away thinking there just might be something to this notion of “fit” and Nebraska’s next quarterback. I don’t know if I necessarily entered the day that way. It was an idea that made sense in theory. The Huskers’ offense should operate more efficiently with a quarterback that fits the Riley/Langsdorf mold, something Nebraska didn’t have the previous two seasons. But theories are just that. Saturday, however, was a little bit of proof. Not all the proof. That will have to come on some cold, gray day in November with something on the line. The spring game said maybe that day could be this November. Here’s why I think that could be the case. Riley’s offense has always seemed conceptually strong in the passing game. If a play has three routes from some combination of receivers, those three routes are each designed to stress a defense in different ways. Apply pressure here, here and here, and the idea is that one of those guys should come open because you’ve made it very difficult for a defense to cover all three perfectly. That idea hinges on a quarterback who can assess where the stress is taking its toll on a defense, do it in a short amount of time, over and over again, with defensive linemen doing their best to break said quarterback in half. We didn’t see that type of pass rush on Saturday, but a lot of those other things checked out. Twenty-four receivers caught a total of 62 balls. Seven running backs and four tight ends had catches on the day. Just play pitch-and-catch coaches always say. That’s what the 2017 spring game looked like. Of course, a good day from the quarterbacks doesn’t answer all the Huskers’ questions entering 2017. It probably doesn’t even answer any of the most important ones. Those for me still include the offensive line and the running game in some combination. The new 3-4 defense was kept under lock and key, but I think that part will pan out just fine. The right “fit” at quarterback won’t be enough to propel the Huskers to titles in 2017 on its own, but it’s no longer just a talking point either. There’s something to it and that’s something I was uncertain about before this souped-up scrimmage on a mostly sunny spring day.